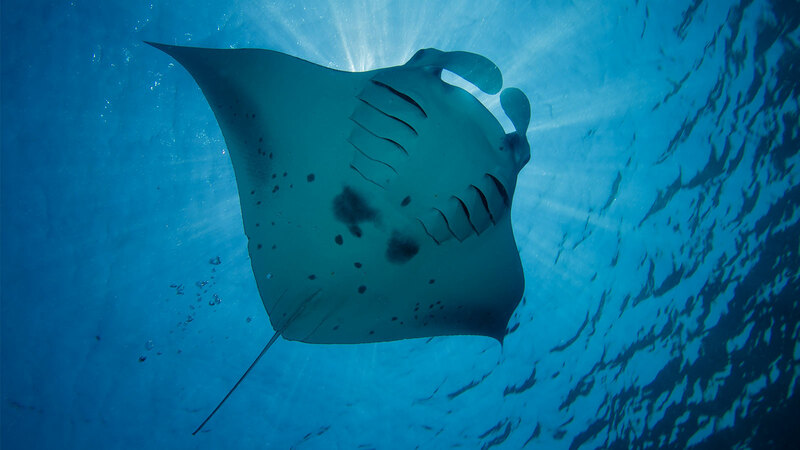 Kuredu Ocean Watersport is pleased to notify you of a new record: this past week we spotted more than 35 manta rays on one of our snorkel trips! Words can hardly describe what we experienced on Sunday morning: being eye to eye with a 3-meter manta ray is already pretty impressive, but seeing more than 35 of these oceanic giants in one place is a moment one never forgets. It must have been a feast for the manta rays that were coming together at Dhanifaru, a well-known manta point some 25 minutes by speedboat from Kuredu. When mantas feed on plankton, they often gather in large groups, just like they did on Sunday. To maximise their food consumption, the mantas have developed special feeding strategies, barrel rolling being one of them; mantas do funny back flips while they glide through the water. Another technique, which we even captured on camera, is chain feeding. Here, the mantas line up head to tail and work together to improve their plankton consumption. If you want to see this spectacle yourself, join us on our daily manta trips. Of course you need to be a little lucky to witness a feeding frenzy like this, but at the end of the day, it does not matter if you meet 35 different individuals or only one friendly manta that swims right at you – being close up and personal with these majestic creatures is always unique! In case you weren’t here with us to experience the manta mania yourself, we captured it on camera for you to see what surprises the ocean around Kuredu can throw in! Windy days, windy fun at HurawalhiIt’s Time for Wakeboarding and Water Skiing at Hurawalhi!